TAIPEI: Taiwan's breathtaking outdoor environment and the arrival of spring provide ideal conditions for young fans to enjoy Taiwanese and international music. Music festivals of all kinds sprout in Southern Taiwan and pack the town with music fans, campers and those ready to shake off winter. The emergence and growth of festivals goes hand in hand with the growth and diversification of Taiwan's nascent youth music scene. At the festivals, the music usually centers around rock and pop but there have been increasing numbers of DJs spinning electronic music and experimental musicians fusing elements from various genres and countries. 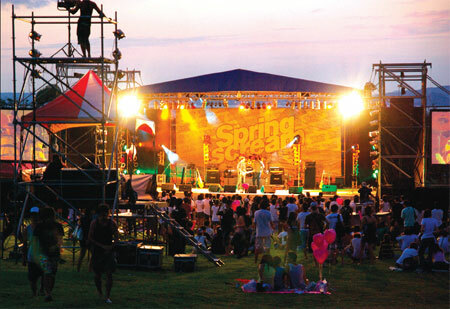 Held annually in Kenting, Spring Scream is one of the most popular annual outdoor music festivals. Founded in 1995 by Americans Jimi Moe and Wade Davis, who first moved to Taiwan as English teachers, the festival has grown into an annual event. "Every year we've improved and we like to be consistent with that improvement," said Moe. This year, the organisers have "redesigned stages to have a more intimate feel". There will be six or seven stages including a DJ dance floor, film screening area, music and air guitar contest which "adds up to eight stages depending on your definition of a stage." The most unique stage is likely the backdrop of Taiwan's Kenting. "This place is reminiscent of Hong Kong's Stanley Market with high coastal roads and hills sloping down to the water. Grassy slopes that are incredibly beautiful and we want the stages to fit in with the environment," said Moe. The downside is that the area loses its appeal when massive crowds show up. A common complaint is that of the "ballooning effect of traffic and tourism because Kenting is too crowded that weekend," Moe said. Spring Scream is hardly the only festival and Moe looks at the number of imitators and competitors as a compliment. Competing festivals of past and present include the Formoz Music Festival featuring hard rock and metal genres, and the Hohaiyan Festival. In the past eight years, about 15 to 20 events have come and gone, said Moe. Every April, there is an average of four events in the same weekend. "Most of them are not invited back for a second year because of problems with taxes, legal issues and the police. Indeed, a complex proposal and approval process by the local government is required to get a license to use the area as a music festival space," he said. Cedric Sam is a fan and avid blogger about Chinese-language music from Hong Kong, Taiwan and the mainland. He attended Spring Scream last year. "I first heard of Spring Scream from watching a YouTube video of a live concert given by Cheer Chen at the 2007 Spring Scream festival. 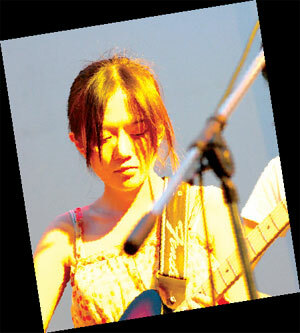 In 2008 in fact, she joined the lineup of a more commercialized music festival in Kenting called Spring Wave." For Sam, the attraction is not only related to music. "Spring Scream is (held) during the long weekend of the tomb-sweeping holiday. Many young people go down to Kenting not for Spring Scream but just to hang out at one of the many music events, like rave parties on beaches, DJ sets by a lake." "It's a national park, with a few 'villages' lined with guest houses, restaurants and bars. At normal time, the streets are pretty much empty. When the festival time arrives, each strip of town becomes an outdoor party, like nothing I've seen before in my life," he said. This outdoor party atmosphere is not always a positive factor. Some fans prefer to keep the music scene more private and there have been reports of problems with the police and drug arrests. Another music fan complained that "unfortunately, Kenting has recently become overcrowded with tons of parties and other festivals ... after the weekend is over, the streets are trashed." Still, the emphasis remains on the music. 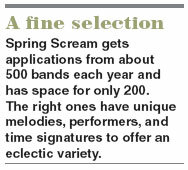 Spring Scream gets applications from about 500 bands each year and has space for only 200. The right ones have "unique melodies, performers, time signatures to offer an eclectic variety ... we even try to include mainstream pop as a viable genre," said Moe. "We look for variety and I'd like to introduce a wider audience to a wide variety of music." Sean Scanlan, an entertainment writer and columnist for local newspaper The China Post, believes that "Spring Scream is the original prime mover. I know for a fact that this festival was the inspiration behind Formoz Festival and, to some extent, Hohaiyan Festival, a beachside event sponsored by the government." One Taiwan music fan has attended both Formoz and Hohaiyan festivals in the past. He described the former as featuring "a variety of top acts from Japan and the United States with many great local bands playing all day and into the night." It is unique because of its location at Yuanshan Park, "with its many winding paths that lead to various stages." This fan also described Hohaiyan as a special event held at Fulong Beach in northern Taiwan "and is a great time to see music on the beach." He described Hohaiyan as a special event at Fulong Beach in northern Taiwan "that is a great time to see music on the beach." Some of the featured artists have included Mach Pelican, 5678's, Dirty Three, Andrew WK and Jon Spencer Blues Explosion. Needless to say, there is no shortage of saccharine sweet pop songs found ubiquitously in karaoke bars all over Asia. It simply takes a bit of effort to venture to the pristine beaches in search of the latest sounds. The music festival scene is not limited to seaside festivals. In urban centers, there is plenty of creativity not restricted to indie rock, experimental groups or mainstream pop. Dirt Star is one such creative individual. He describes himself as a musician who "makes songs about life". A Taipei newspaper described his music as "cute robots" with "punk rockers". "I'm a rocker at heart. I try to make music that juxtaposes common sounds from our everyday life. Like chatting online, eating snacks and playing with cats. I use a lot of samples from the world around me too, like school bells, people talking, ocean waves, street traffic and toys." "Because it's such a wired place, everyone has access to all kinds of information - so kids can get into music very young and develop their own music tastes. And they make music part of their life," he said in between his busy recording schedules. Wan Ting Huang, another young musician, dabbles in a variety of musical genres with her punk and rock band named Ladybug in Hsi Pan Jie (Tin Pan Alley) and electronic project, VARO. As Huang pointed out, Taiwan's youth music scene is not without its downsides as people "have very few chances to see bands from the US or Europe," she said. "Everything is cheap, so businessmen can ask most of the bands play for free, and everyone takes it for granted." Among the best known contemporary bands from Taiwan's youth music scene are 88 Guava Seedz, Cheer Chan, Shine Shine Shine, White Eyes and Soda Green. "Our music is different from other hip hop music," said lead lyricist Fan-Chiang. "Our music is inspired by Taiwan traditional music elements. We bring samples of Taiwanese folk songs and traditional music elements and mix them with hip hop to create a very unique sound. Through our music, you can hear the voices of Taiwan," he said. He believes that Taiwan's hip hop scene has a lot of growing up to do, which is why most of Kou Chou Ching's influences are foreign hip hop artists such as DJ Krush from Japan and "golden age" hip hop artists from the US like Wu-Tang Clan, Run-DMC and Public Enemy. Locally, the band has been influenced by Labour Exchange Band and Lim Giong. For these musicians, career highlights usually happen on tour. "I think our best tour was Tokyo Tour 2008," he said. "We learnt many techniques from Japan's indie bands and the Japanese audiences are very enthusiastic- it encourages us. I think all Taiwan indie bands need try to perform in other countries." Musicians generally agree that the best thing about Taiwan's youth music scene is that it is small and tightly knit. "So many people had played in the same bands together and I can picture all these family trees like charts connecting various musicians to bands of all styles," said Marty Hodulick, founder of Island of Sound and Pacifiction Records, online retail shops that negotiate directly with bands in Taiwan and other parts of Asia. Currently living in Japan and originally from New York, he spent 15 months in Taiwan as an English teacher when he first discovered Taiwanese artists like Cheer Chen and Sandee Chen. "I found this interconnectivity to be pretty special," he said. "The festival atmospheres were also pretty cool and laid back ... There's a certain smallness (where] one can feel comfortable in Taiwan." 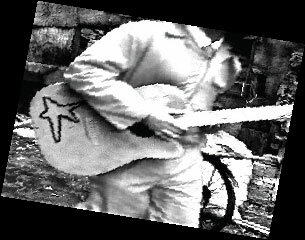 His website promotes a wide range of music from both Asia and abroad to "keep it real" for every scene. He said Taiwan's music scene has had some interesting highs and lows ranging from mandatory military service for young men, a lack of market for indie music and a shortage of practice space. Others also explained that pop culture has flourished in the last 20 years, since Taiwan opened up to Western culture after martial law loosened its grip. "(It's an) interesting phenomenon with the economy waxing and waning," observed Spring Scream organizer Moe. "People worry about finances in times of hardship and create great music to escape the struggle of their daily burden." He believes many new and unique sounding bands will emerge from the economic difficulties. "In a tight economy, musicians are usually some of the first to experience this struggle and there's great music when they express it." And there is plenty of room for growth. Taiwan's youth music scene is still in its infancy and has yet to become a rival to Japan or the growing scene in Beijing. Still, "we are seeing a number of indie artists blow up," said entertainment columnist Scalan. "For example Cheer Chen is now scheduling stadium shows in Beijing, and Soda Green is getting ready for a similar jump. "Our best artists are quickly making the transition to major stars." In between balancing multiple musical projects and dreams of touring abroad, Huang like her fellow musicians does not hesitate to express optimism about Taiwan's youth music scene: "Everyone says that it's getting better every year."